A new air quality monitor has been installed in West Mifflin, the Allegheny County Health Department announced Monday. The monitor, which was installed at the New Emerson Elementary School on Pennsylvania Avenue, will measure sulfur dioxide, or SO2, emissions from the U.S. Steel Irvin Works facility. 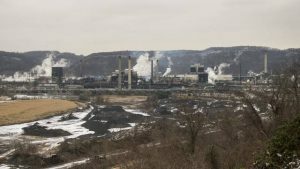 Residents and air quality advocates have been calling for increased monitoring and oversight of emissions since a Dec. 24 fire at Clairton Coke Works hindered the facility’s ability to clean coke oven gas. The health department issued an alert Jan. 9 , 2.5 weeks after the fire, advising residents — especially those with asthma, bronchitis or emphysema, as well as children and the elderly — that there could subsequently be higher than usual SO2 emissions throughout the Mon Valley. Coke oven gas, which could contain pollutants including SO2 if not cleaned, is flared at Irvin Works. That facility is about five miles away from Clairton Coke Works. The West Mifflin monitor is the second of two new air quality monitors the health department set out to install in recent weeks.